Social Media — Steve Whalen "Mr. Jokes"
I know what you're thinking - these days, it almost feels like the websites are ANTI-SOCIAL MEDIA!!! If you like original material, late night musings, funny videos of classic stand-ups and just plain weird vids, my social media presence is just for you!!! Please follow and remember, it's so easy to click "like"!!! Daily Jokes, Late Night Jokes, Classic Stand-Up Comedy Clips and Photos of me, Steve Whalen!!! Follow and tune in everyday for classic material!!! I’m so fat the last time I uploaded a video into THE CLOUD, it started raining!!! THESE ARE JUST MY LAST FEW POSTS - CLICK HERE TO VISIT AND FOLLOW ME ON INSTAGRAM!!! If you like funny goofs, plugs, and the occasional opinion on a New York sports team, you'll love to follow me on Twitter! CLICK HERE TO VISIT AND FOLLOW ME ON TWITTER! I’m a road comic, alright… I DRIVE PEOPLE AWAY!!! 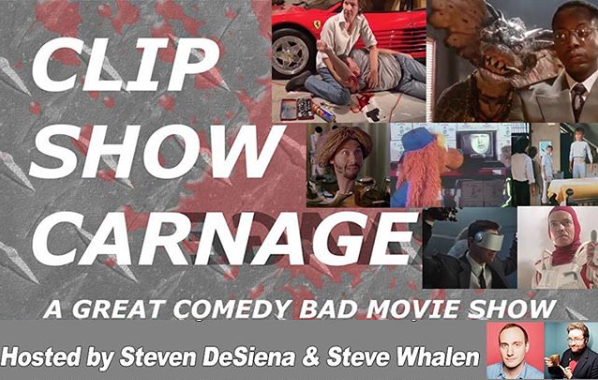 CLIP SHOW CARNAGE is a new comedy show with great performers and bad, bad films. Hosts Steven DeSiena (@StevenDesiena on Instagram, @SDesiena on Twitter) & Steve Whalen (You’re on his website right now) hoist up their favorite moments from the best of the worst b-movies out there, from overambitious action films to low-budget children's animation and everything in between. It is held on the second Thursday of every month at Vital Joint. THESE ARE JUST THE LAST FEW POSTS - CLICK HERE TO VISIT AND FOLLOW CLIP SHOW CARNAGE ON INSTAGRAM!! !